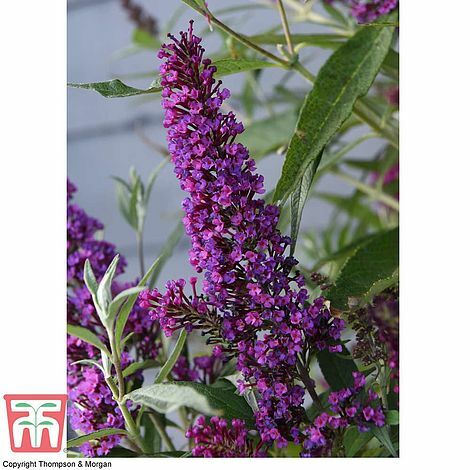 Buddleja ‘Butterfly Towers’ is a world exclusive to Thompson and Morgan. 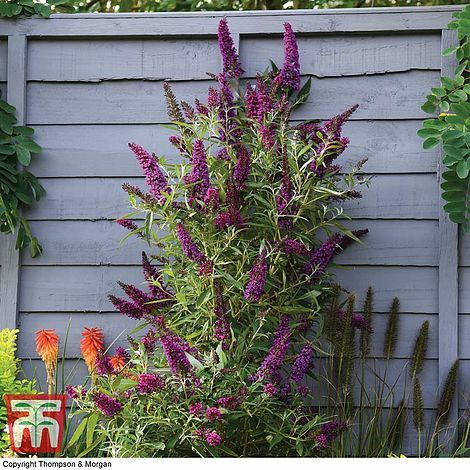 It’s unique selling point is that, unlike earlier Buddleja introductions, it has a narrow and columnar habit. It forms a beautiful tower of mauve-purple flowers. It is perfect for camouflaging fences and unsightly objects and as a hedge it makes an excellent screen. With a height of only 2m (6ft) and a width of 1m (3ft), much less space is needed in our increasingly small plots in comparison to traditional huge Buddlejas, many of which can be unruly thugs. One of the valuable attributes of Buddlejas that has been retained in this new breeding is that the gorgeous upward-pointing flowers of Buddleja ‘Butterfly Towers’ are an absolute magnet for the bees and butterflies that are so valuable to us. It provides them an all summer long supply of nectar. This hardy, low maintenance shrub will be happy in most soils but perhaps ideally would like moisture but good drainage and full sun or semi-shade. However it is also ideal for patio containers, in a loam based compost such a John Innes number three, with regular watering and feeding throughout the summer months. It will flower more prolifically if deadheaded. Buddlejas should be pruned back in spring to a permanent low framework of three or four buds from the base of the plant. I think this new, exciting and easy to grow shrub will be a great success, not only for Thompson & Morgan, but more importantly in our gardens where it will put on a delightful display.